Adobe Illustrator has long been the de facto application for the design department in fashion retailers and brands, used to produce visualisations of designs. However for new designers, and even seasoned designers that are used to more traditional mediums of design communication i.e. pen and paper, the learning curve of Adobe Illustrator can be steep. The scope of the program is vast with functionality adaptable to many different graphic based industries. It can therefore be difficult, even somewhat daunting, to know which features are relevant to fashion design and how to use seemingly generic functionality to produce garment specific detailing. So although there are many training resources available, both online and published, they are not ideal for learning Adobe Illustrator in the context of fashion. Many are also outdated, particularly published materials, and with the advent of Adobe’s Creative Cloud new functionality is being added in multiple new releases each year. 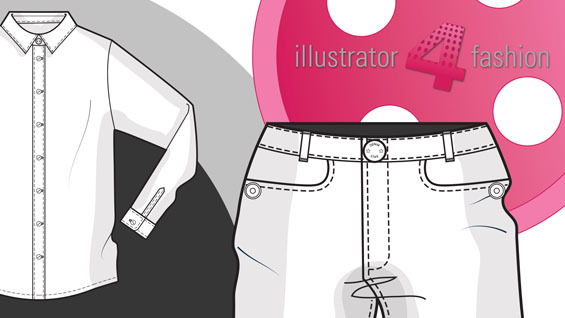 Illustrator 4 Fashion, launched 1st February this year by Apparel Thing, offers students, universities, designers and companies, online Adobe Illustrator CC training that has been specifically tailored towards fashion drawing. The training is constantly updated with every new release with any features relevant to fashion drawing. The course is split into 3 levels, level 1 aimed at beginners who have had no experience with Adobe Illustrator and goes through all the core tools and functionality needed to draw basic fashion flats. Levels 2 and 3 are aimed at users that have a basic working knowledge of the tools in Illustrator who are now looking for more advanced skills and techniques to produce creative, accurate product designs quickly and to standards required for retail and manufacturing. Example tutorials include; building reusable trim libraries, learning how to use brushes to create detailing such as topstitching and zips, creating fashion illustrations, producing design cards and colourway boards and optimising files for sending downstream and system integration.